So this is Hell’s Gate? First things first: wordpress seems to be messing with some of the formatting, so we apologize for any weirdness with the page right now. We’re working on getting everything fixed. Should you ever find yourself at the oddly named Possum Kingdom Lake northwest of Fort Worth, prepare to be amazed. The lake has amazingly high limestone cliffs great potential for sport routes or DWS. 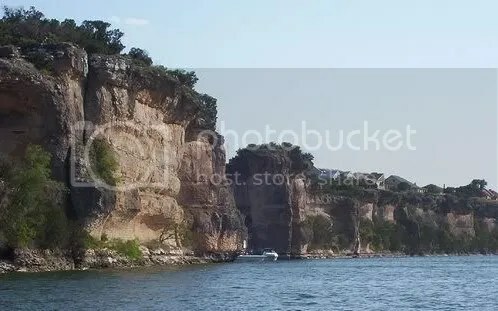 However, as with most locations in Texas, the cliffs either belong to the government or are in the private hands of the wealthy. Either way, the rule of the day is STAY OFF. Jumping from heights above 20 is prohibited, as is climbing or rappelling on Brazos River Authority lands. This picture is of the area known as Hell’s Gate. It opens to a secluded cove that’s typically occupied by drunk college students, or those who wish they were still drunk college students. This pic shows some of the amazing potential found along the shores of the lake. If only the McMansions weren’t occupying the top.